Daydreams of Quilts: Sew Mama Sew Giveaway Day! ***UPDATE*** The winner of this giveaway as chosen by Random Number Generator is comment number 322: Sandra. She said, "I have heard people talking about going to Canada. I would think that the trips planned would probably be visiting the Prince Edward Island. I know that would be where I would go. My ex-husband is French Canadian and I know that if he were to go to Canada, there is where he would go. Thank you for being a part of the Sew Mama Sew giveaway and giving all of us a chance to win the $50.00 gift card to go fabric shopping. Very generous giveaway on your part"
It's Sew Mama Sew Giveaway Day (well, Giveaway week). Yay! A much anticipated event in sewing and blogland. If you haven't been to my blog before - Welcome! And if you have - Welcome back! I am a Canadian Quilter, military wife and Mom to two kids (expecting my third this fall). I LOVE quilting! I can't stop thinking about it so that is why my blog is called "Daydreams of Quilts." I currently work full time at a Fire Hall as an administrative assistant but will be back to stay-at-home Mom at the end of June. I thought long and hard about what my giveaway prize would be this time around. I know for myself there are some lovely bundles over at Westwood Acres that I am dying to buy. 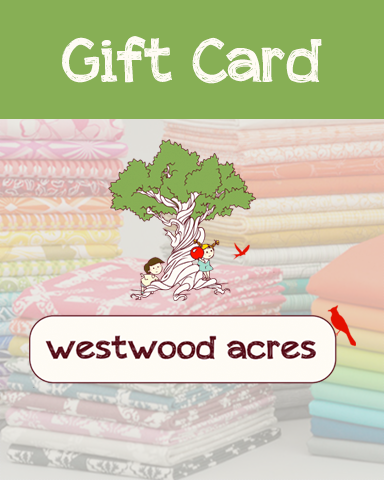 So I am giving away a $50 gift card to Westwood Acres. To win this prize please leave a comment on this post telling me something you know about Canada, your favorite fact about Canada or your favorite place to visit in Canada. This giveaway is open to everyone. The Giveaway is open from May 12 - May 16 5:00 p.m. PST. I normally respond to all comments that are not "no-reply blogger" but will not be able to during this very busy time. I'm sure you understand. Have fun for Giveaway Day (week) and best of luck! Go back to Sew Mama Sew to enter more giveaways!! !